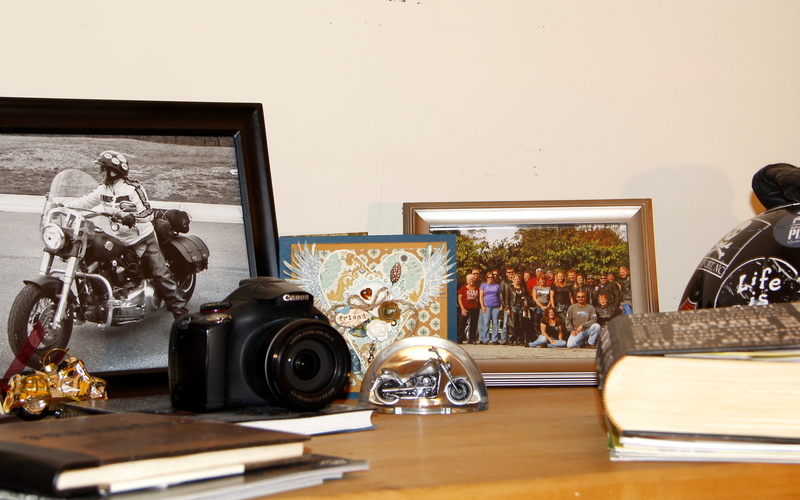 A few months after the wreck, I realized that I had unintentionally created a shrine of sorts, to the bike. and a box filled with the many, many cards I was so grateful to have received. How nice that, through the joy of blogging on WordPress, I was gifted with wonderful additions to that collection. Debby, from Apple Moon Creations, sent me what I like to call Book Art. She folds the pages of books into familiar and favorite things. Debby is so clever and if you want to know how she folds these books into art, check out this link. 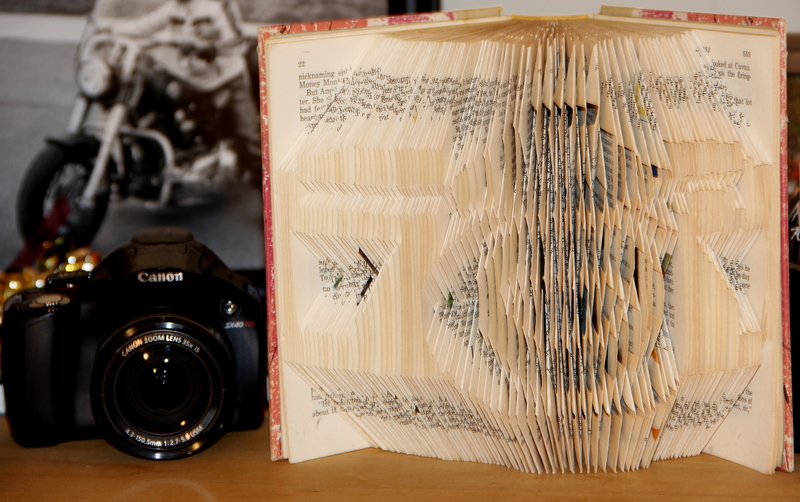 Debby made the comment that it is hard to photograph a folded book and I very much agree! 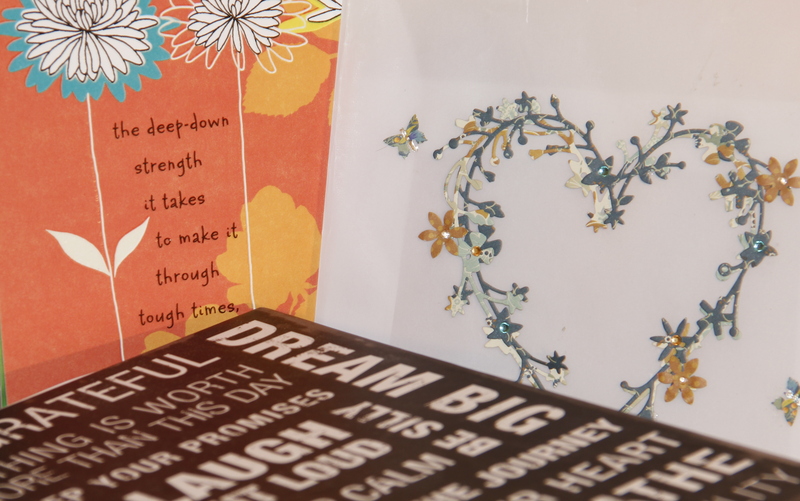 Blogging has brought gifts of friendship, and more blessings than I ever thought imaginable. In addition to the connections with people from all over the world, I have gained insight, been inspired, and grown as a photographer. Thank you so much, Debby! Everyone – please check out Apple Moon Creations! 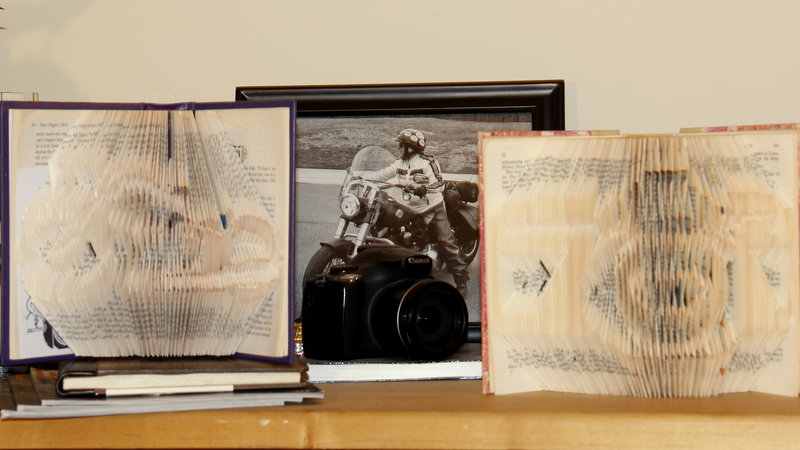 This entry was posted in Blogging, Motorcycles, Photography, The Bike and tagged Book Art, Camera, Folded Books, Gifts of Blogging, Motorcycle, Motorcycle Wreck. Bookmark the permalink. Debby’s work is amazing, so intricate and detailed! Blogging has a way of bringing people together…sometimes we are fortunate to meet special people! And someday, I’ll get the Bloggers Coctail Party planned! Those books are so awesome. What a shame about your bike, but so glad you are well. As you well know, life does change in seconds, doesn’t it? I’m so glad you checked out Debby’s blog; I was touched with her gift. Blogging with WP has been incredible and I loved reading your recent post about the gifts of blogging. I need to go to your Etsy site (I have no idea how to do that as I’ve never been to Etsy … can you share the link?). I love those cards you’ve been making. Life can – and does – change dramatically in seconds! I have picked up the phone and put it down two minutes later with a completely different future in front of me; stood at the top of a flight of stairs and 30 seconds later – boom! Opened a letter and moved 500 miles …… and so on and so forth 🙂 We never know what fate has in store for us. There’s a direct link to my Etsy store on my home page under the banner of the gorgeous Orlando. Over the next week or so I should be up loading a few more bits I’ve been a bit tardy about adding in. I think we all have made new friends blogging….thanks for letting me be a part of it! And I’m so glad we’ve become blogging friends, Jeff. I enjoy your ruminations and thoughts on the many joys of riding. I too enjoy what you do! Thank you LMA! We all have insights, commentary, photos, and love to share … and that is the joy, isn’t it? I am glad to have met you, and grateful that you are recovered from that day. You have traveled on many journeys since we met, but the journey of healing is the most profound. Is it not? They say that what doesn’t kill us makes us stronger. You are a very strong woman, Laurie. Lynda, thank you. Your words mean much to me, as I know you have traveled quite the road as well. I was thinking about you yesterday as I haven’t seen an update from you recently. I certainly could have missed one. Life seems to have been chaotic lately for many reasons. I, of course, totally understand the “shrine” thing!!!!! Debby’s art has come a long ways and branched out in many directions. Her blog is a must-visit for sure!!!!! I was thinking of your post about Debby’s books when I was writing mine. What a gift! Absolutely and so “not me”!!!! That’s what “makes the world go ’round”!!!!!! Yes it is amazing, and you have certainly been a friend, a giver of gifts, and have taught me much, Joe. I thank you. Thank you so much for the post and praise. For me, the joy of creating is the sharing. I’m happy to have been able to give something a home. Blogging friendships are a delightful and unexpected gift. Enjoy your day. I’m glad you liked the post, Debby, and I know that folks have checked out your blog because of the post, which was inspired by your generosity. Thank you again! That is what the world is all about. Would be happy to do the same for anyone interested – that’s sometimes a hard thing for people to believe/accept so you can vouch for the authenticity if one of your friends have an interest 🙂 You are most welcome. I think a shrine is just what you needed. 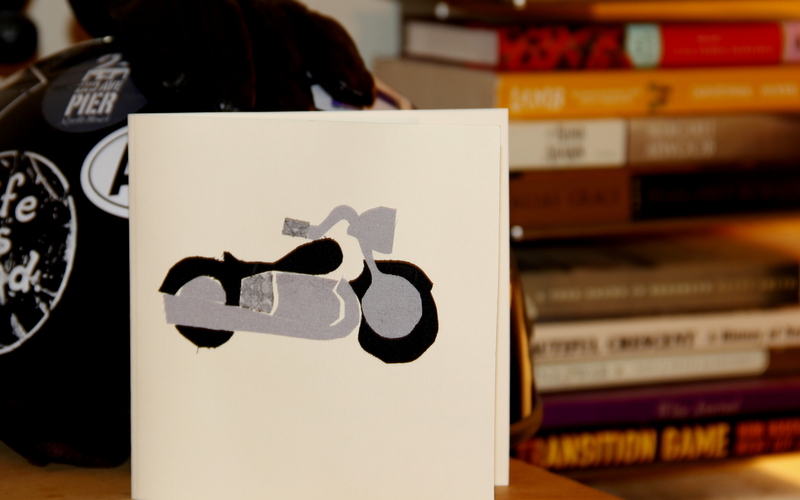 It’s nice to see all the cards and the beautiful book art along with photos of you on the bike. I just posted today about bloggers and gifts and the joy they bring. We’re all traveling on a similar page. Pauline said much the same thing. I hope you are feeling better each and every day. I just visited your blog to check out your new post. You are indeed well loved, my friend. What a joy! Thank you for your thoughts here … they are a gift to me. Thank you, Laurie. I’ve been thinking about you a lot today. Sending hugs your way. You are so right … fortunate indeed! I’ve ridden in SC and can not imagine going without a helmet! Without one, I surely wouldn not be here. Thanks, Joshi! I’m a lucky gal! Isn’t it great to learn the talents of others? LB, you have such a genuine voice that I’m sure your friends in the blogosphere feel they know you. I sure do. Every time I read your blog I get the itch to get back on the bike, so thanks! Hey, I was planning to give you a shout out in an upcoming blog. Probably within the next week or so. Just wanted you to know. Stay well and keep up the great work. Jim, your comment is a gift. Thank you! and how fun to know I’ll get a shout out! I’ll be watching / reading! What a wonderful addition to your collection. So many gifted people sharing their talents with others on the internet. It’s wonderful to feel a part of such a great blogging community. It is an amazing community, isn’t it? I feel very fortunate to have run into so many talented, incredible people … of which you are one, Deborah. BTW the book art is wonderful. How creative people are! 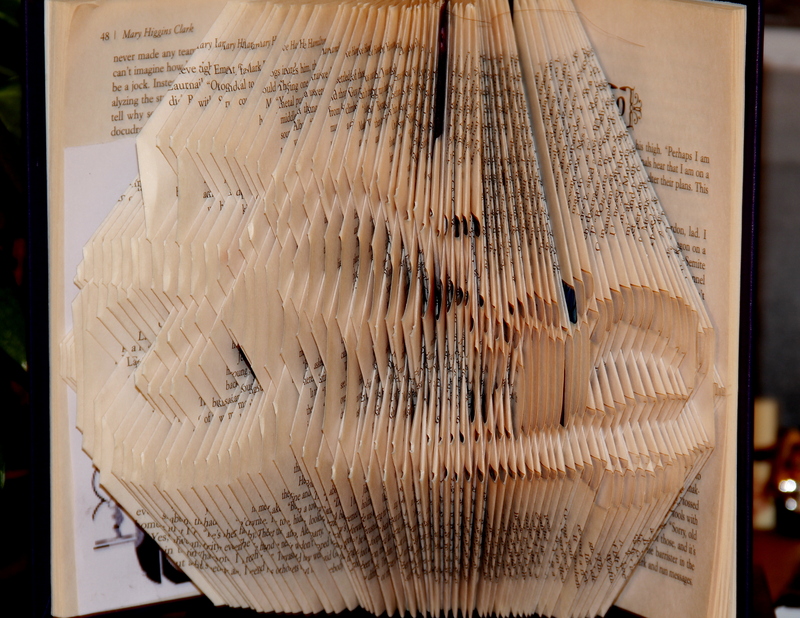 I’ve seen folded books like that, layer open and then photo’s tucked to stand in the folds. Very cool! Here’s a link. “I get by with a little help from my friends” – thanks to you! Wonderful photos. I am very pleased that I’ve gotten to know such a talented photographer and deeply good person. You are too kind and have made me smile this morning. Thank YOU! From an anthropological perspective, a shrine is something that comes from deep within and tells something very personal about the person who made it. The fact that yours happened without planning is proof. So many people, from so many perspectives, for so many reasons, build shrines. I believe it’s important. You are walking in the footsteps of human history. Ok, enough of that. It’s also really cool! And I’m blown away by Debby’s work. Sorry to hear about your bike, but glad that things are continuing to get better!